The markets have generally had a bullish view of equities for much of the year so far, but not everyone is buying stocks. 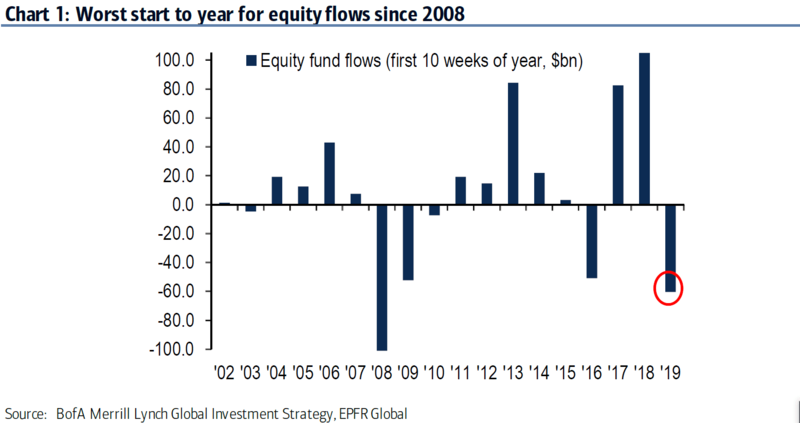 In fact, Bank of America Merrill Lynch reports that this year has brought the worst start to the year for equity flows since 2008. Last week BofAML recorded $10.1 billion in outflows from stocks, of which $5.5 billion of those outflows were in U.S. stocks alone. The firm's clients were clearly selling into strength as global stocks were up 10.6% for the week. 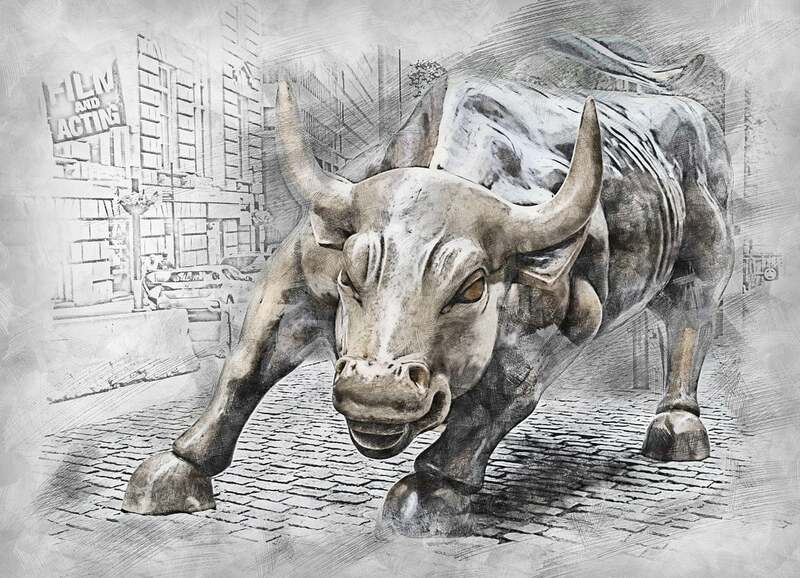 BofAML Chief Investment Strategist Michael Hartnett and team pointed out that the equity bull market officially turns 10 on Saturday. Over the last decade, the U.S. market capitalization has increased $21.3 trillion, which is triple the U.S. GDP's increase of $6.5 billion. The only other asset which saw outflows last week was gold, which incidentally has performed well toward the end of this week, finally breaking above the key $1,300 per ounce level so many experts have been watching. According to BofAML, commodities were up 12.6% the same week gold recorded outflows. Precious metals saw $1.2 billion in outflows, the highest in 28 weeks. The only other "bearish" flow, according to the firm, was the $8.8 billion in inflows to bonds. Hartnett and team also said their Bull & Bear Indicator dropped for the first time this year, falling from 5.1 to 4.9. The drop is especially notable because of how quickly the indicator has shifted from buy territory just a few months ago deep into neutral territory now. 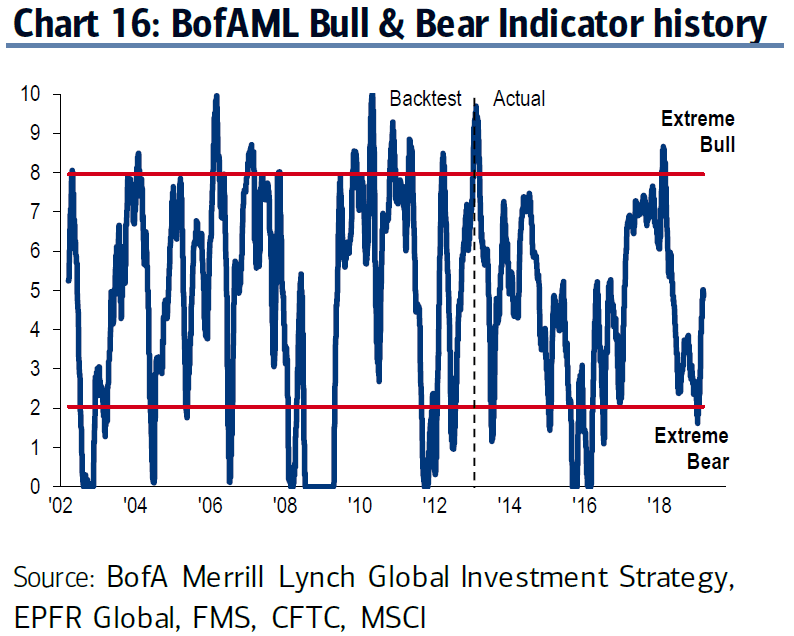 In fact, their Bull & Bear Indicator was in "extreme bull" territory just last year. Harnett and team also found that flows significantly favor credit over stocks. 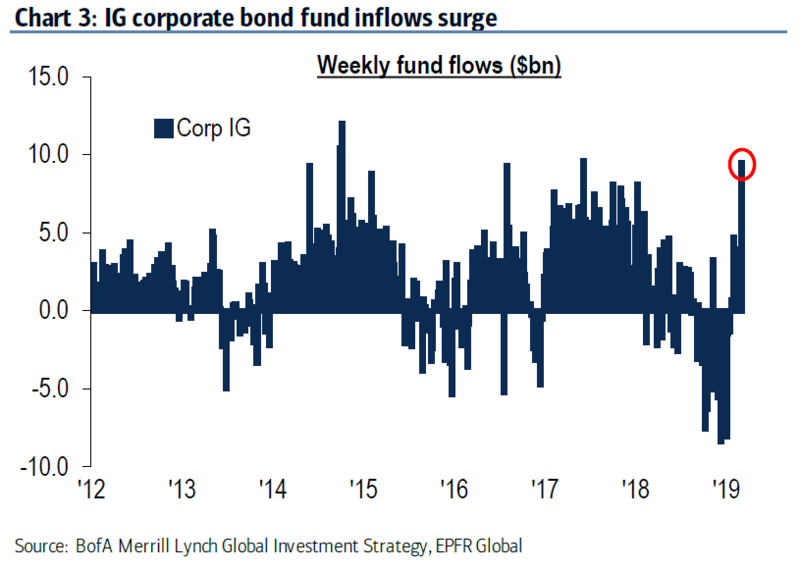 In fact, this past week brought the fourth-largest inflows to investment-grade bonds ever recorded at $9.5 billion. We would also note that other sources have indicated that pension funds, which are among the biggest investors of all, have been increasingly favoring credit over the last several months. Canaccord Genuity has been tracking record-high pension flows to credit and related products over other asset classes for months. Meanwhile, emerging market equity flows were essentially flat with $100 million in net outflows over the last three weeks. The U.S. dollar has remained strong, hindering EM equities in the process. BofAML said that looking across multiple asset classes, cross-asset positioning remains neutral but with "a significant bias for credit over stocks." This factor, plus the macro pessimism keeps Hartnett and his team "tactically contrarian bullish." Hartnett and team also reported a "buyers' strike" in cyclicals with European stocks seeing outflows of $3.1 billion. 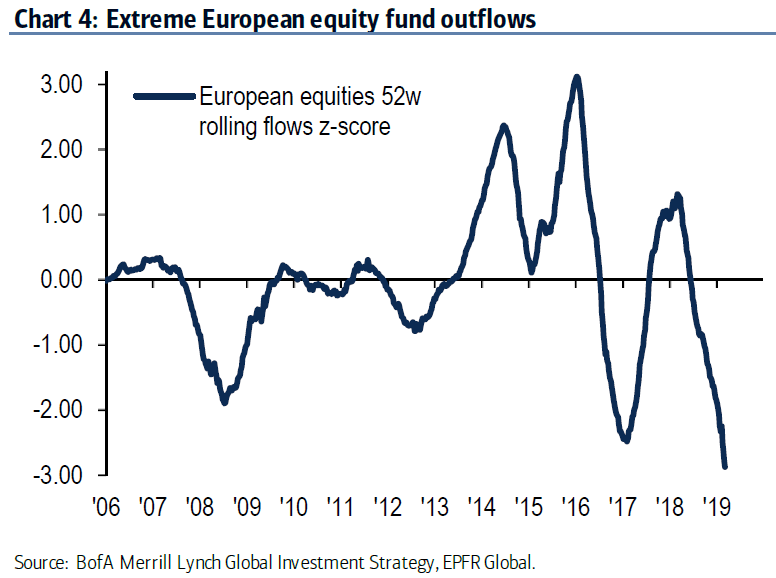 In fact, they see European stocks as the "ultimate contrarian trade" right now. 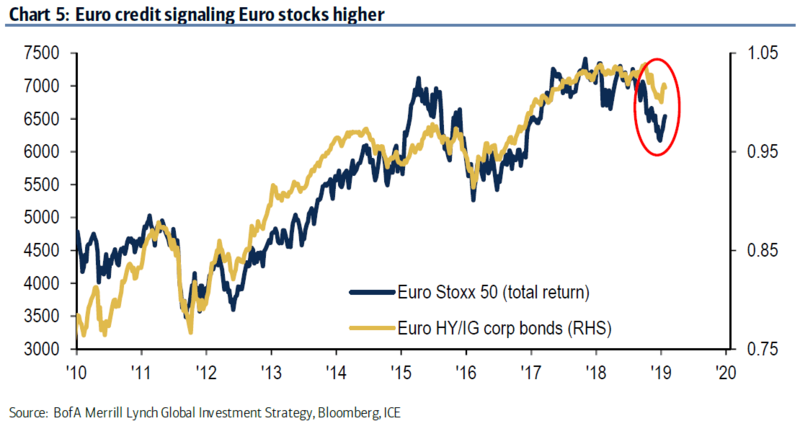 BofAML expects European stocks to outperform in the second quarter as tightening Euro credit signals a move higher for European stocks. BofAML added that 10 years after the Global Financial Crisis, the Eurozone remains "trapped" in a "deflationary 'Japanification' of growth & interest rates." As a result, Harnett doesn't think the EU will raise rates, and EU stocks remain in a "value trap." He also describes the "Europe = Japan" trade as "the most consensus trade in the world."